Share solution and proposal materials with your client without having to email documents, presentations and videos. Avoid having to drag in a laptop and switch between files. Projecting or sending presentations could also be viewed as outdated. 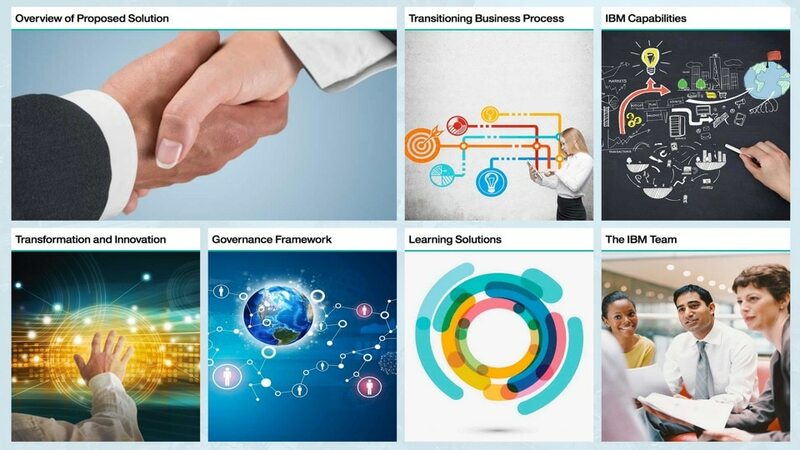 IBM® Client Vantage enables you to have all your materials one tap or click away – even without an internet connection. You can combine a variety of media types that are digitally presented on a mobile device or a browser. In the past, communicating status has been sending charts by email. Many times there is no Project Control Book organizing all the project documentation and communications. If there is, it is usually a clunky, hard to use shared file repository. Client Vantage can be customized to organize and present all of this in a digital and eye appealing way. A tap or click will give you access to the latest information. No more sending emails or searching folders and worrying about version control. During delivery of services, either internally or by a vendor, metrics are used to measure performance. The volume of metrics can easily be in the triple digits, making them difficult to view and manage. Client Vantage has a digital dashboard that consolidates hundreds of metrics into an at-a-glance executive view – and yet you can still drill down into an individual metric. A click or tap enables you to sort by type or region and view historical data. Internal collateral for teams is often scattered across many different systems and can be poorly organized. 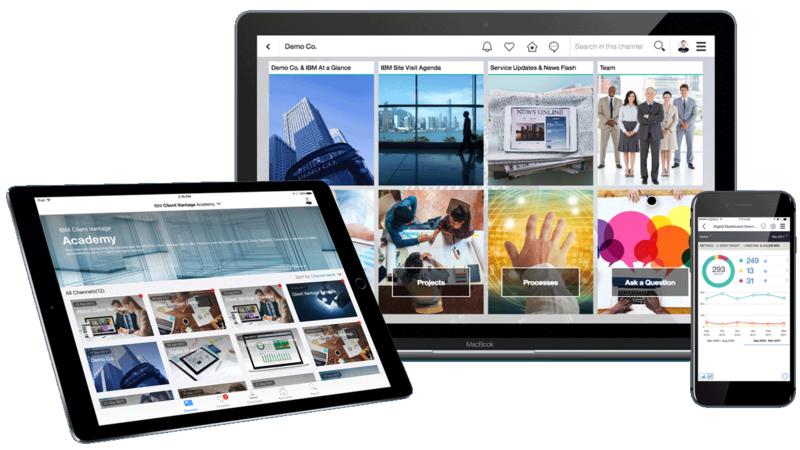 Client Vantage pulls this content together in an easy-to-use and mobile interface – making it easily consumable. Bring focus to key collateral that your teams need, regardless of the media – including links to source materials and downloadable core content. Many people are still carrying a laptop to their client's location and fumbling around with multiple files to share information contained in PowerPoint presentations, spreadsheets, documents and videos to get their point across. IBM Client Vantage helps you better interact and communicate with clients by creating and maintaining custom channels for each client. These channels contain information in an eye-catching format – easily accessible on laptops or mobile devices. Operational metrics are critical measures of success and are often contractual commitments. But ensuring they are available to all appropriate parties can be labor intensive and challenging. 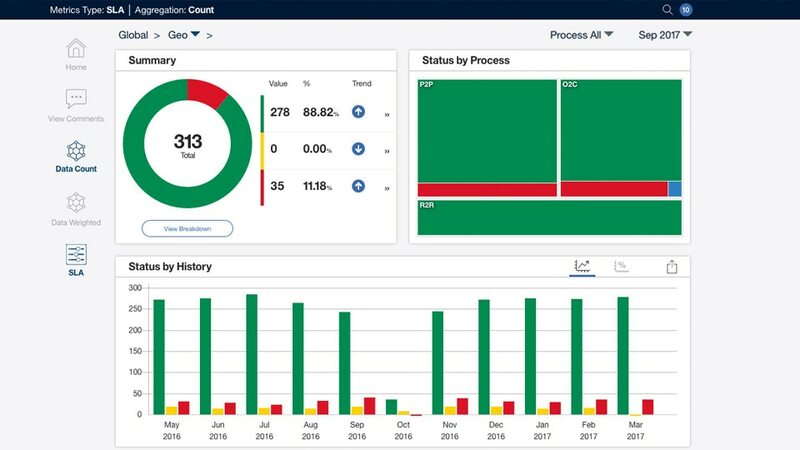 IBM Client Vantage Digital Dashboard can be added to any custom client channel, providing a clean UI for hundreds of operational metrics. This dashboard gives you an executive view but allows you to drill down to individual metrics and their history.